1st image Shown with Console Closed at 48"
2nd Image Shown with Console Open at 60"
3rd Image Shown with Console Open at 72"
Best Answer: The pieces are fully assembled in the box. They just have to be placed next to each other and the bridge on top secured. 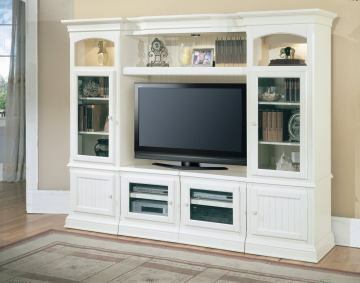 My TV is 57" W X 33" H. Will the console accommodate 33" height?